Your new spouse has many wonderful qualities, but soon after the wedding you learn that a high credit score is not among them. What should you do? 1. Credit score: how bad is it? Get copies of your credit reports from AnnualCreditReport.com and get your FICO or VantageScore credit scores to learn where you stand. You're entitled to free copies of your credit reports once a year from each of the credit reporting bureaus, but you might have to pay a small fee to learn your credit scores. Check reports for accuracy, and follow credit bureau instructions to correct any factual errors. You each maintain individual credit scores when you're married, but both scores factor into a lender's decision if you apply for a joint account. You qualify for better credit card rates if you apply in your own name than if you apply with your spouse. Maintain separate accounts for now until your spouse's credit improves. If you want an account together, apply in your name and add your spouse as an authorized user. 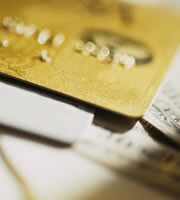 Lay your credit cards on the table and plan how to pay down credit card debt as quickly as possible. Your spouse's credit score improves as the percentage of debt related to credit limits goes down. Pay bills on time to boost credit scores. Late payments count against you. When your spouse's credit improves with steady debt reduction and on-time payments, consider getting a joint credit account. Handling that account responsibly further improves credit. Keep all credit card balances below 30 percent of their limits to preserve good credit scores, and don't apply for more credit than you need. Set financial goals, and start setting aside money every month to build emergency savings, so you don't have to rely on credit cards for unexpected expenses, like car repairs and medical bills. Talk about how to handle and track finances. Who pays the bills? At what price point should you consult one another before making a purchase? Poor credit is reversible. With responsible money management, your spouse's credit can turn around over time, and the process of planning a financial future can bring you together. 0 Responses to "When good credit marries bad credit"